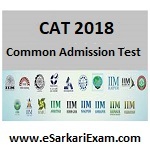 Eligible Candidates can Download CAT 2018 Admit Card at the Official Website of IIM CAT. Applicants First Logon to IIM CAT Official Website. Open Download CAT 2018 Admit Card Link.